We offer extra dives with all PADI courses in Phuket. No sub-standard beach diving because we’d like our guests experience the best scuba diving Phuket has to offer. We also have a perfect safety record. Free Super Divers t-shirt for all guests taking a PADI course with us. Inclusive prices with no hidden extras. No credit card surcharges & an easy online booking process. We have by far the best cancellation & refund policy you’ll find at any Phuket scuba diving center. 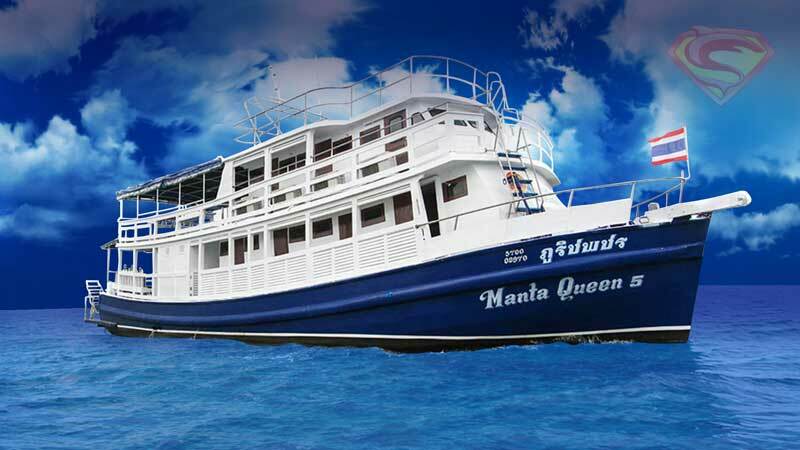 Complimentary return hotel transfers on boat diving days from Kamala, Patong, Karon, Kata, Chalong, Rawai & Nai Harn. (Small surcharge from other areas). Complimentary hotel pick-up on day one of the PADI open water course from Kamala, Patong, Karon, & Kata to bring guests to Super Divers located in Patong. (Small surcharge from other areas). We use well maintained, safe, & comfortable dive boats. Tasty & freshly cooked breakfast & lunch on the boat included, with snacks, fresh water, & soft drinks provided throughout the day. Our scuba diving equipment is replaced regularly, & well maintained. Since opening for business in 2010 we have a 100% accident free safety record. Super Divers is fully affiliated with PADI, the biggest dive organization in the world. Super Divers PADI 5 Star Dive Centre number is S-22241. We are also We’re regulated and certified by the Tourism Authority of Thailand – TAT License 34/02222. One of the best experiences in Phuket! 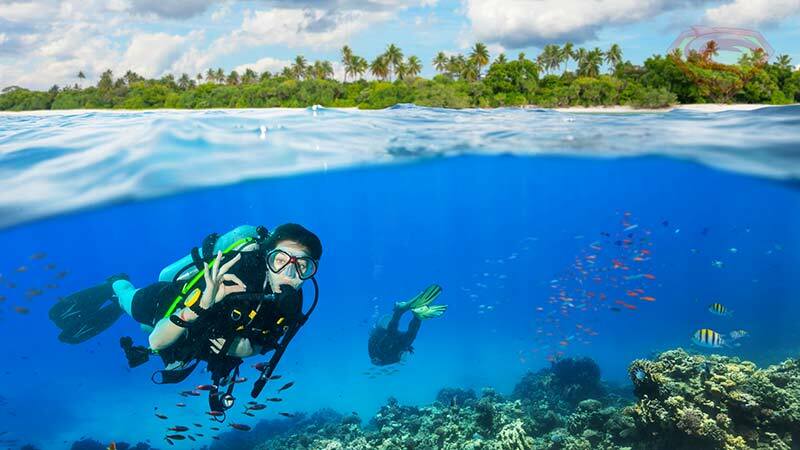 The scuba diving Phuket can offer certified divers consists of three main Phuket scuba diving day trips, with three dives on each day trip. Although geographically the Phuket scuba diving day trip locations are relatively close to one another, they are each quite different. The diversity of marine life & corals, underwater landscapes, general dive conditions including currents & visibility, make each Phuket scuba diving day trip unique. 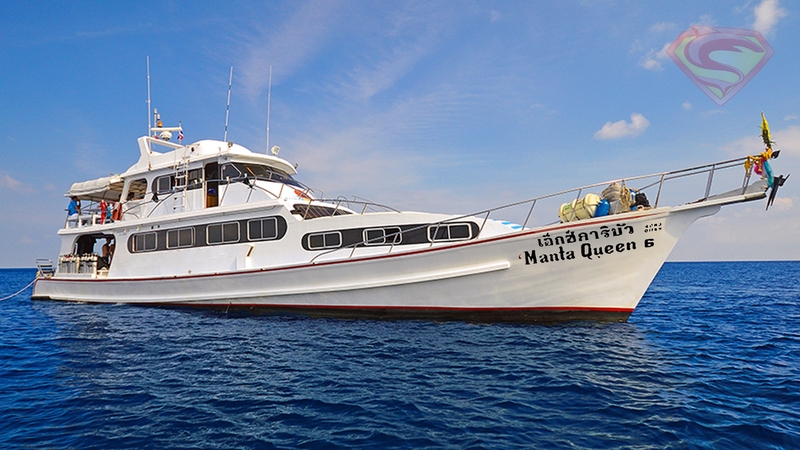 Our scuba diving day trips in Phuket start with hotel transfers at around 7:30am, & return between 5:30pm and 6:30pm. Super Divers can also of course provide all dive equipment. 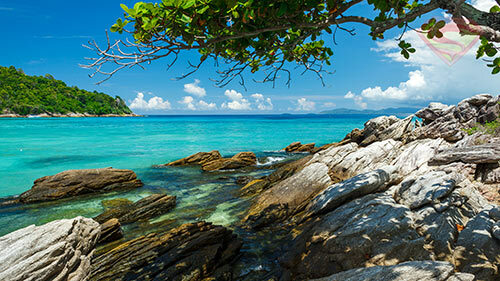 Our Racha Noi & Yai scuba diving day trip is suitable for all levels. Conditions are usually good throughout the year, even when the weather isn’t at its best. Visibility occasionally exceeds forty meters. 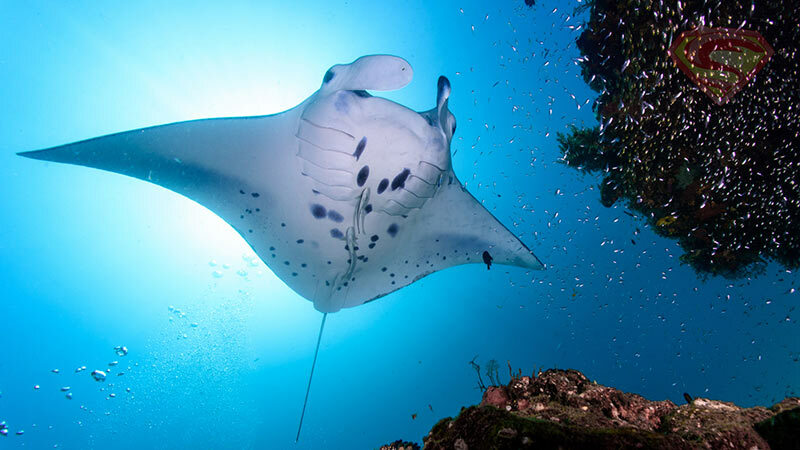 Racha Noi is the only Phuket scuba diving day trip where we often spot giant manta rays. Our Phi Phi scuba diving day trip also suits divers of all levels. 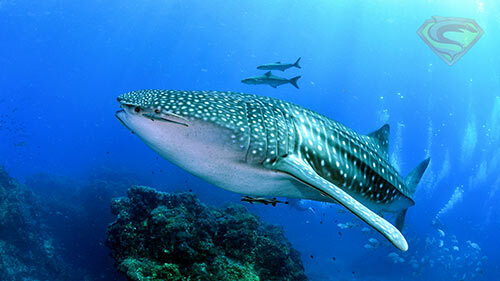 The marine life found at Phi Phi is abundant & diverse, with a chance to see sharks if conditions are right. 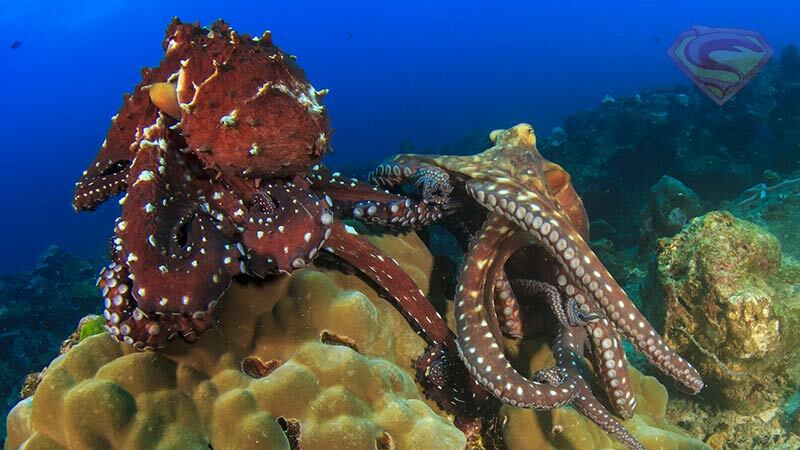 Conditions & visibility are less predictable with best diving at Phi Phi from late October to early May. 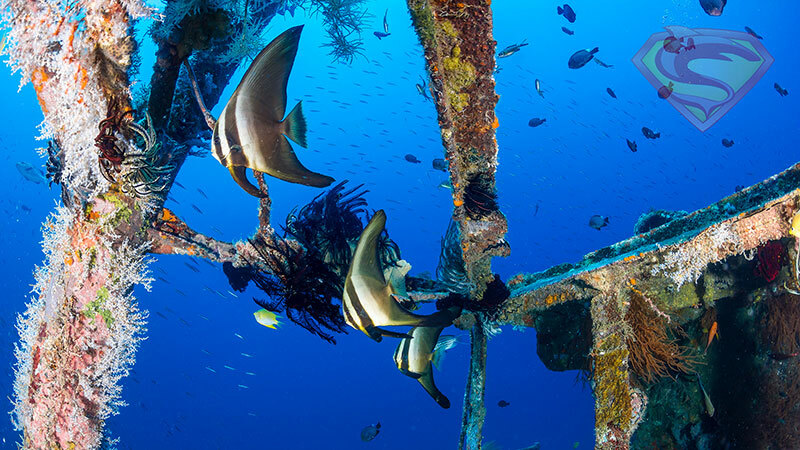 Ask us about day trips for certified divers! Our King Cruiser wreck scuba diving day trip includes Shark Point & Koh Doc Mai, suiting divers with the PADI advanced certification or higher. 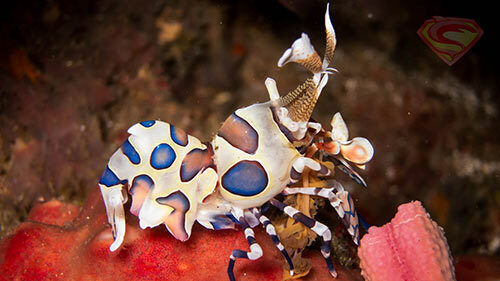 Conditions are variable, & there’s lots of cool marine life to see on this Phuket scuba diving day trip. 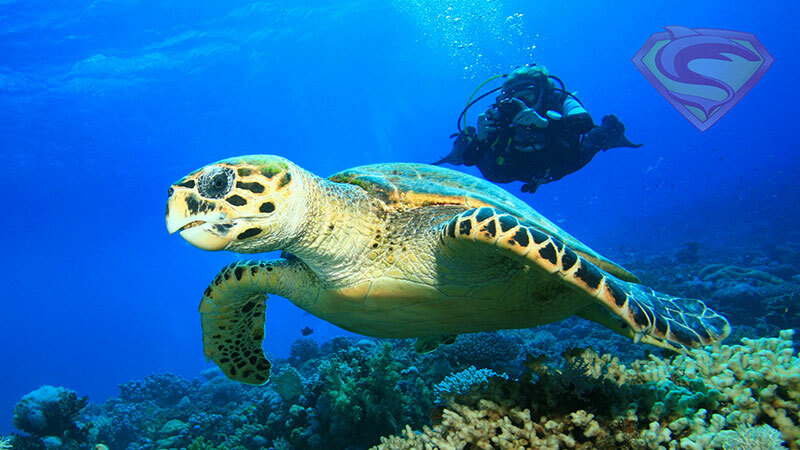 All Phuket scuba diving day trips we offer to certified divers include three dives. Return hotel transfers start at 7:30am & are complimentary from most areas in Phuket. Breakfast, lunch, snacks & refreshments are included. Guests should bring any personal items they think they may need for a day spent on a dive boat scuba diving around Phuket, including swim wear, a towel, proof of dive certification, & logbooks if they’d like to log their dives. Non-divers / snorkelers wishing to accompany their diving friends or family, are welcome to join our Phuket scuba diving day trips for a small charge. We offer a 10% discount to certified divers booking three or more separate Phuket scuba diving day trips. All certified divers also receive a free Super Divers t-shirt which can be collected from Super Divers dive center in Patong. Offer is limited to one t-shirt per guest. Racha Noi & Racha Yai scuba diving day trips from Phuket include three dives at some interesting & colorful Phuket scuba diving sites. Suitable for all levels, visibility is usually very good. 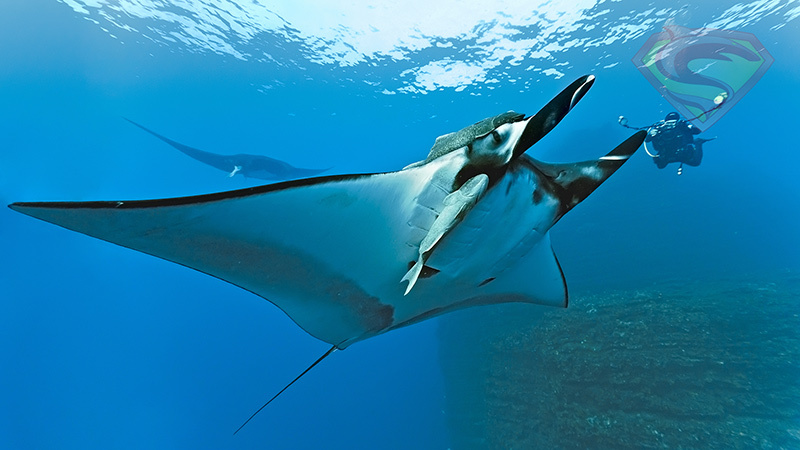 Chance to see giant manta rays at Racha Noi. 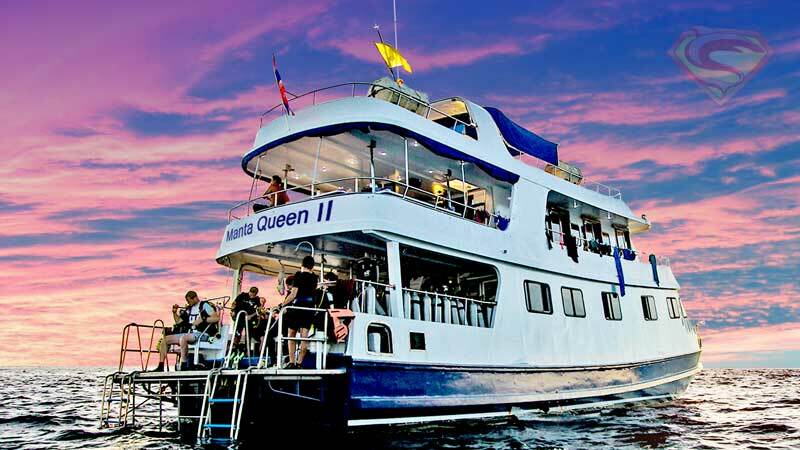 Phi Phi scuba diving day trips from Phuket have three dives & showcases some of the best scuba diving Phuket has to offer. 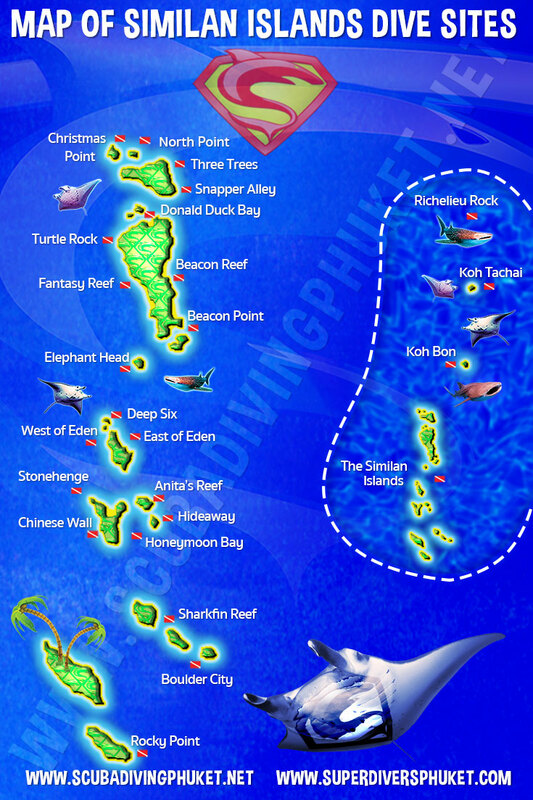 Possible marine life at Phi Phi scuba diving sites includes sharks, turtles, & a huge diversity of aquatic life. Festooned with colourful soft corals the King Cruiser Wreck Phuket has become home to an abundance of marine life brimming with diversity. 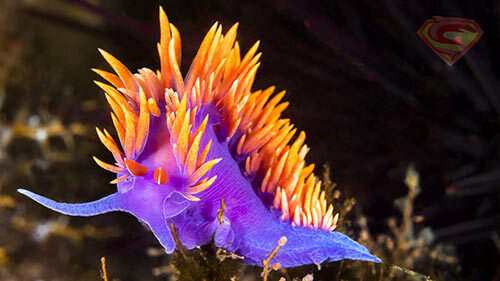 This trip suits divers with their advanced certification & PADI advanced students. 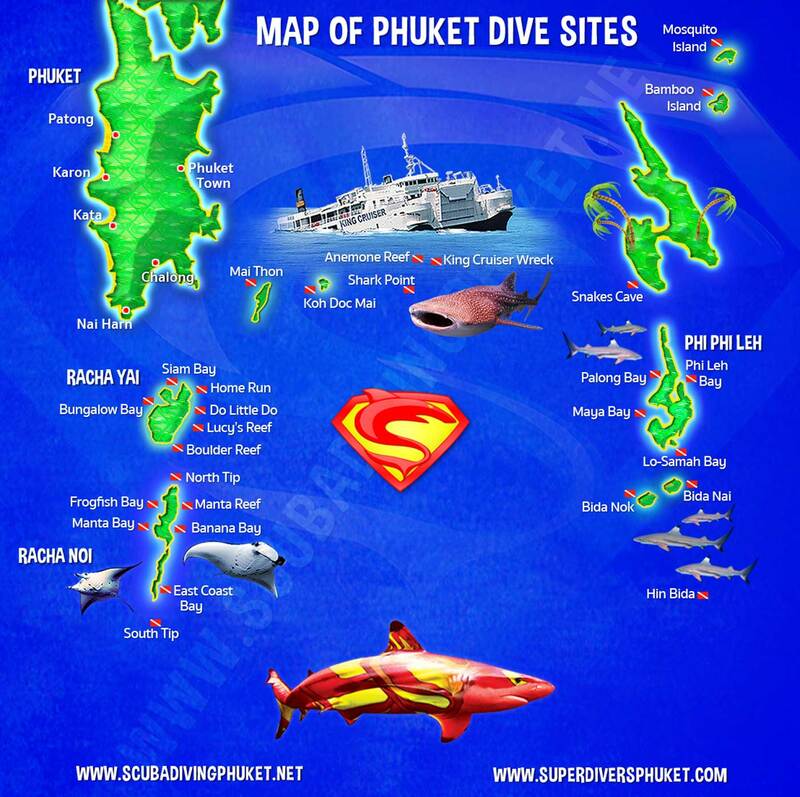 Why Choose Super Divers for Phuket Scuba Diving Day Trips? Small dive groups & a personal service. We value safety which is why we employ experienced & professional PADI instructors who possess many additional personal attributes which make them some of the best dive professionals in Phuket. Because safety & customer service is our priority, we don’t try to save money by using inexperienced & underqualified interns who will pay us to lead dives. The best cancellation & refund policy you’ll find from any Phuket scuba diving center. We offer full refunds for cancellations made before 5:00pm the evening before a day trip commences. Inclusive prices, no credit card surcharges & an easy online booking process. Complimentary return transfers from Kamala, Patong, Karon, Kata, Chalong, & Rawai (We can arrange transfers from outside these areas to for a very reasonable surcharge). ree Super Divers t-shirt for all certified divers, & certified divers booking three or more separate day trips receive a 10% discount from the day trip price. Honest advice and excellent service! 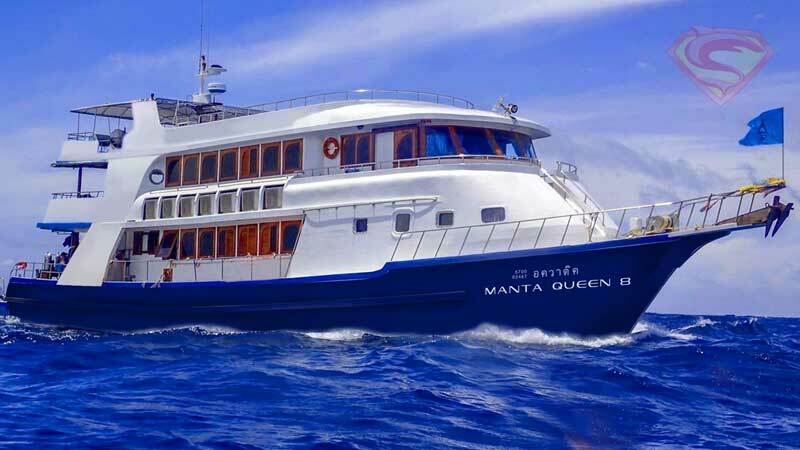 Similan Islands scuba diving liveaboards compared to Similan Islands scuba diving day trips, are the best option for many reasons. 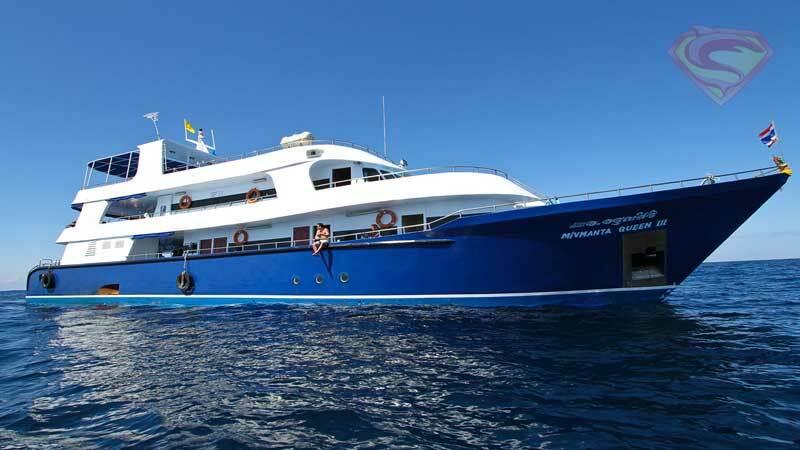 Similan liveaboards are relaxing, have superior dive site itineraries, & also offer better value for money. This is a fact based on feedback we’ve received from the thousands of guests we’ve booked onto both Similan Island liveaboards, & Similan scuba diving day trips over many years. 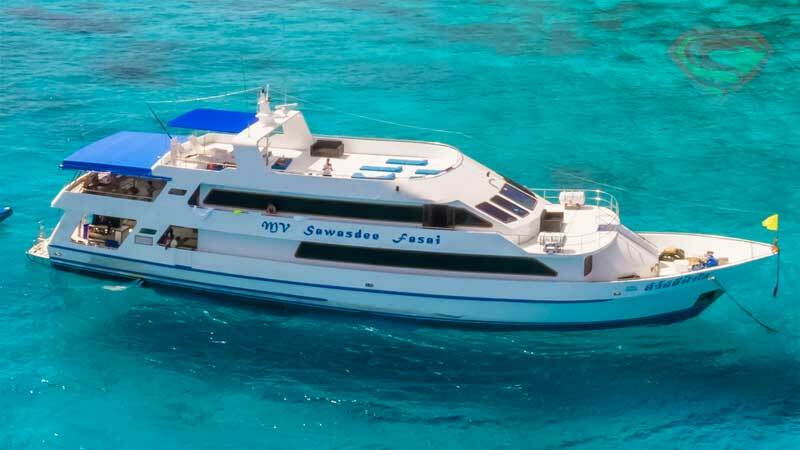 If you want to experience some Similan Islands scuba diving but don’t have time for a Similans liveaboard trip, contact us for additional information & honest advice about the Similan Islands scuba diving day trips we can arrange from Phuket. Similan Islands scuba diving liveaboard trips invariably have evening departures & cruise overnight to the Similan Islands scuba diving paradise arriving before sunrise, allowing guests to marvel at the stunning Similan Islands scenery of white sandy beaches fringed by coconut trees, & crystal clear turquoise water. 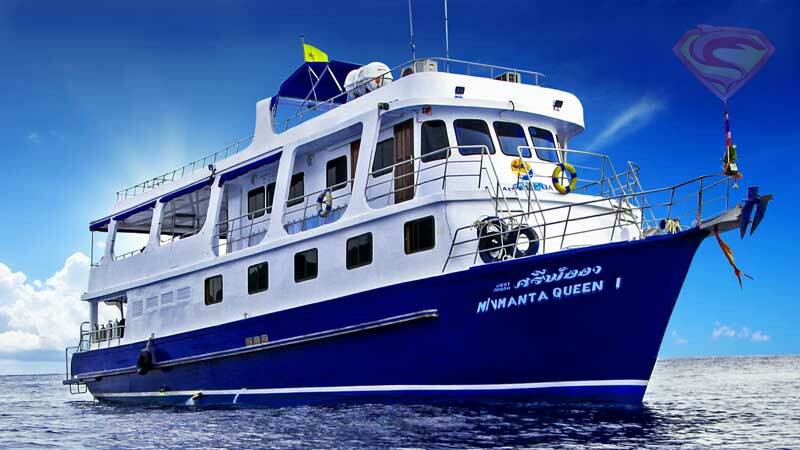 A four-night Similan Islands liveaboard trip offers guests between fourteen or fifteen dives at the best Similan Islands dive sites, as well as at Koh Bon where it’s often possible to scuba dive with manta rays, Koh Tachai, an amazing dive site that attracts whale sharks & manta rays, & Richelieu Rock, the most famous of all the Thailand scuba diving sites. Ask us about Similan liveaboards! 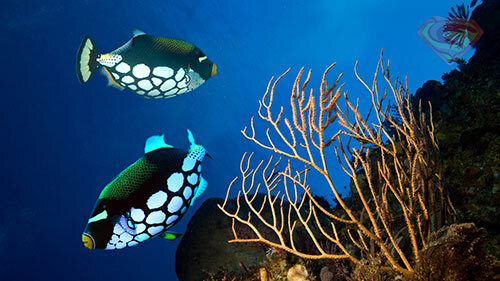 Similan Islands scuba diving is suitable for all levels of certified diver. 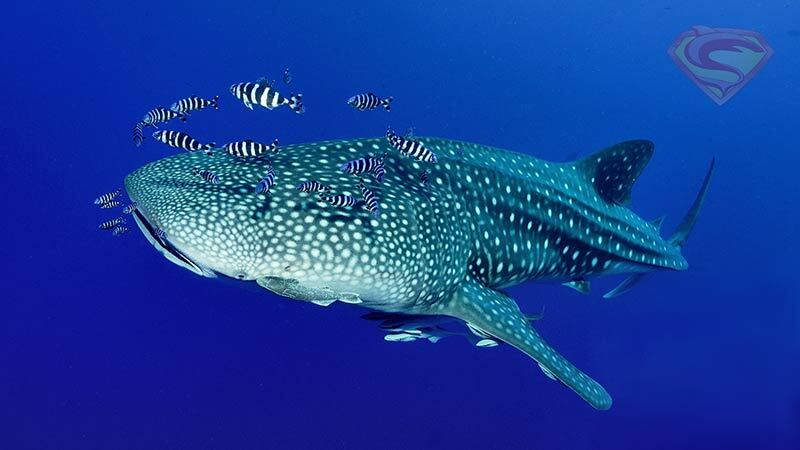 Richelieu Rock is a magnet for whale sharks, & is so rich in diversity it’s home to several species of marine life not found anywhere else in the world. 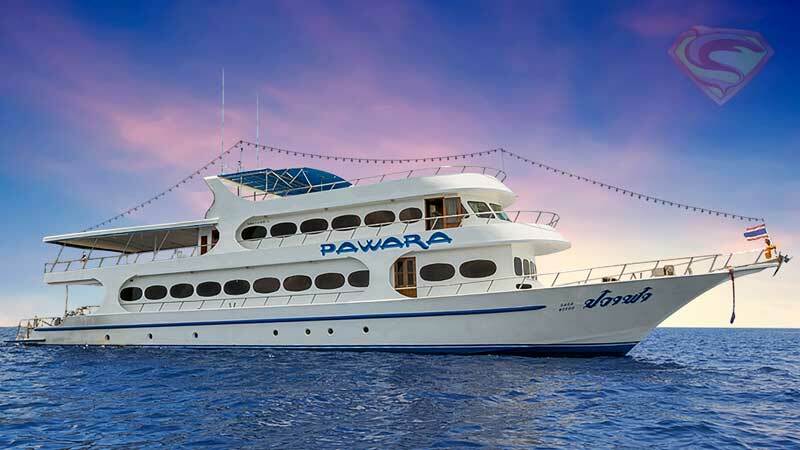 Open water certified divers can choose if they wish, to take the PADI Advanced Course on the Similans liveaboard trip, at a lower than normal price. 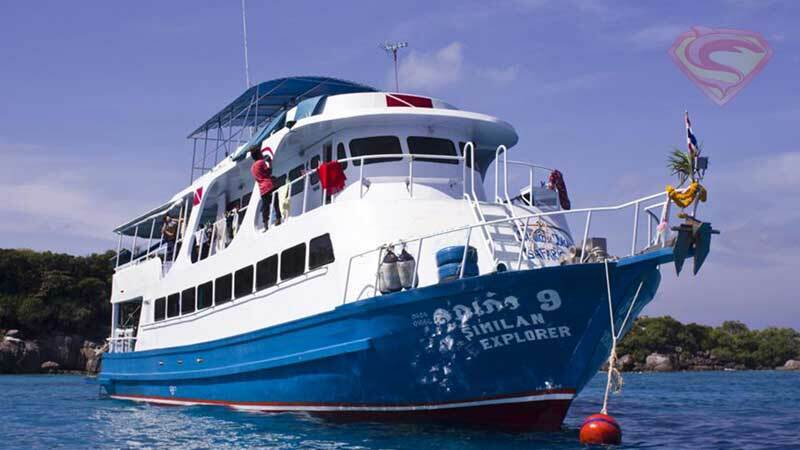 All Similan liveaboards Super Divers offers have nitrox available for certified enriched air divers. 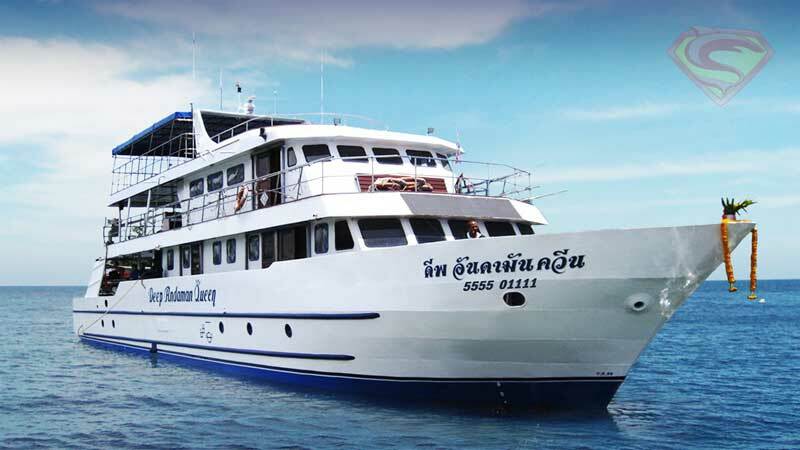 We recommend four-night Similan Liveaboard trips with prices starting as low as 21,500 Thai Baht, as they offer excellent itineraries which cover best Similan Islands dive sites. 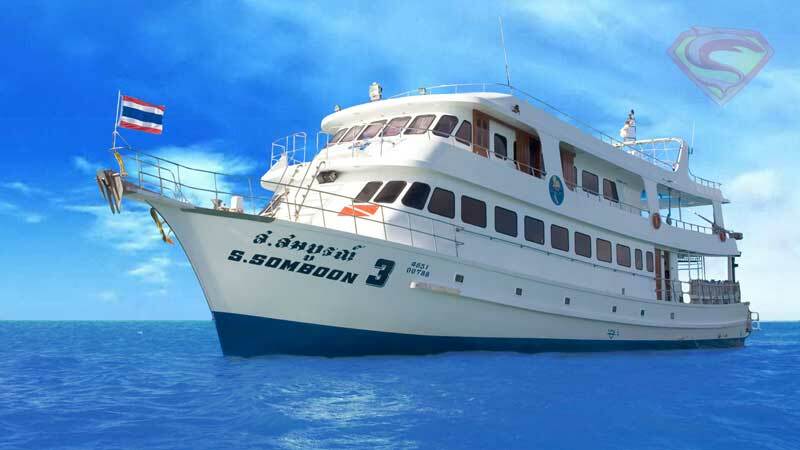 Three night Similan liveaboards are also recommended with prices starting at 17,600 Thai Baht. 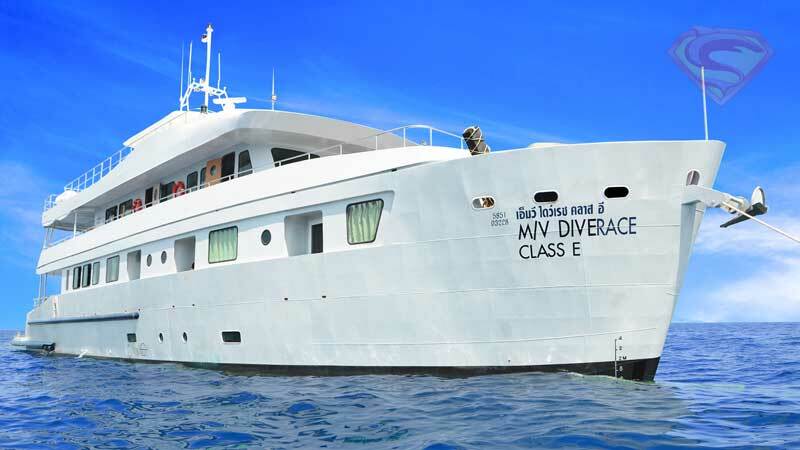 Super Divers guests booking Similan Islands scuba diving on any of the Thailand liveaboards we recommend, may rest assured we only offer the best Similan liveaboard trips which match the high standards and service we believe our guests deserve. 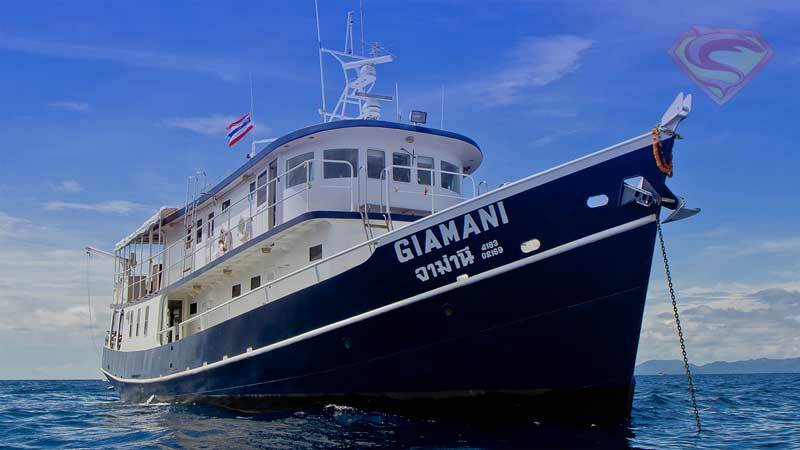 Early booking for Similan liveaboard trips is strongly advised as most trips are fully booked in advance at busy times of the year. Contact Super Divers & we’ll hold your cabin with no obligation, giving you time to finalize your plans until you’re ready to make a book with us online, easily and securely. 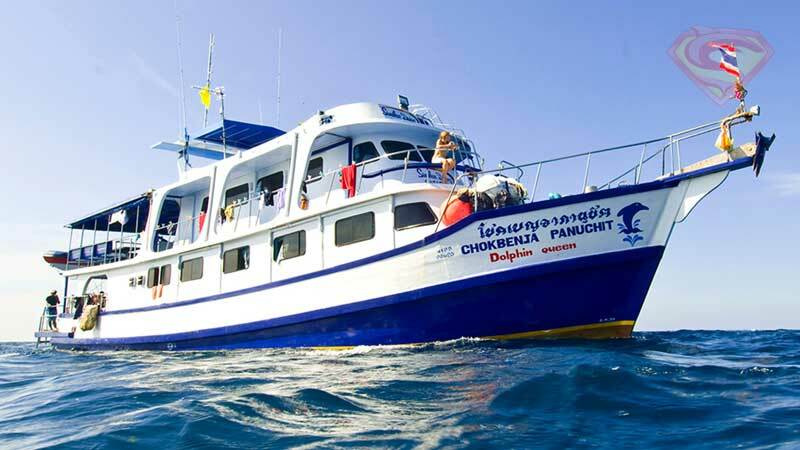 Why Choose Scuba Diving Phuket for Similan Liveaboards? Our business is focused on offering an unbeatable & refreshingly high level of customer service. Customer service is our priority & we always offer honest & reliable advice. If we feel a Similans liveaboard doesn’t care about the level of customer service they offer, we won’t use them. We are one of the only Phuket scuba diving centers that doesn’t add credit card surcharges to any credit card payments we take. 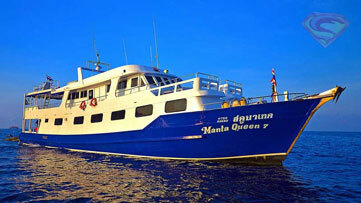 We can arrange return transfers from Phuket for our Similan liveaboard guests. 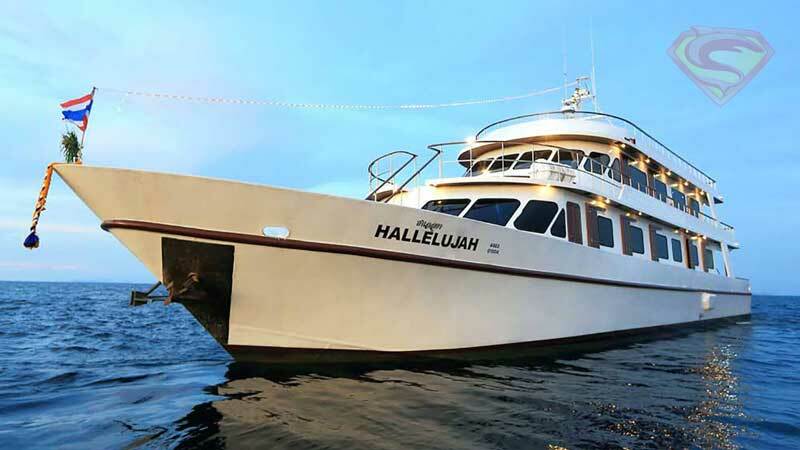 Some liveaboard transfers are included, & some there is a small charge for. Our rental equipment is replaced regularly, and well maintained. We can also provide comfortable fins on request, worn with soft neoprene booties (Not available from other agents or dive centres). If you’re taking a four-night liveaboard trip, these fins could make a huge difference, as they won’t rub the skin off your toes like slip on fins sometimes can do. Guests can request these fins with booties at no additional cost. We can also provide long wetsuits on request, although we recommend our normal shorty 3mm wetsuits in Thailand’s tropical waters. We Care About Customer Service! 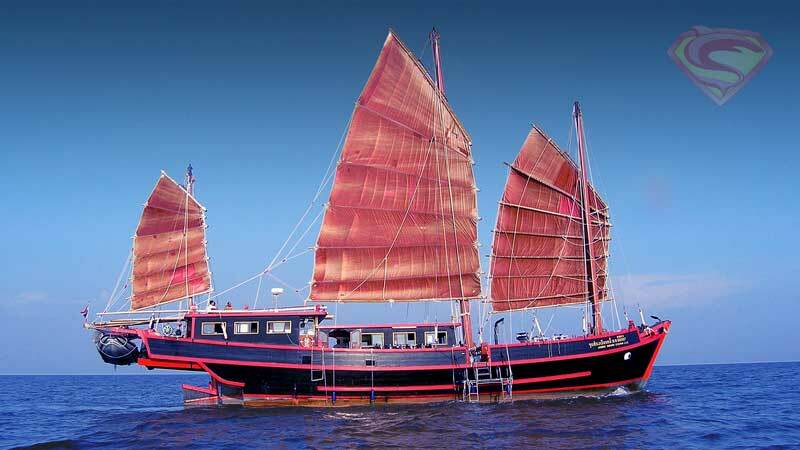 We offer a full selection of the best Similan liveaboards in Thailand. Click below for more info!